In the mid-1960's, Agriculture Canada established the first cattle quarantine facility at Grosse Ile, Quebec. This facility allowed for importation of cattle breeds from Continental Europe. In 1968, a group of cattle imported from Switzerland, included a brown bull by the name of Aron. This Swiss Braunvieh bull displayed significant muscularity. 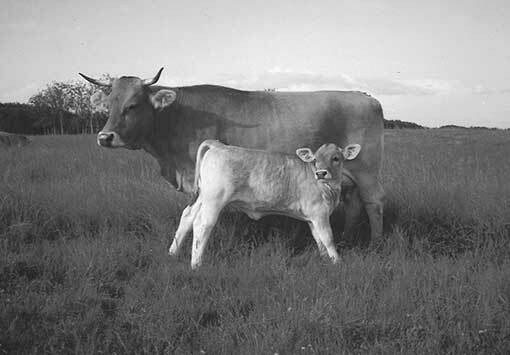 This bull was the start of breeding Brown Swiss and selecting for beef purposes. The Constitution was modified in 1972, to provide for a Beef Section in the Herd Book. This allowed breeders to register their beef progeny in the Beef Section: at the same time it allowed the breeders to register their dairy progeny in the Dairy Section. All cattle registered in the Beef Section were referred to as Beef Brown Swiss. Registration numbers were preceded by the letter “B” for all beef registrations. 1973 was the year that an (I.E.) Identity Enrollment program was initiated for the Beef Section. I.E. cattle were those purebred Brown Swiss that were not registered and had lost their identity. These cattle required inspection to confirm the Brown Swiss phenotype. They were registered and given 75 % purity in the grading up program. In 1996 by mail ballot the membership changed the name: Canadian Brown Swiss Association to Canadian Brown Swiss & Braunvieh Association. Henceforth, the title ‘Brown Swiss’ was exclusive to the Dairy Section of the Herd Book, and the title ‘Braunvieh’ was exclusive to the Beef Section of the Herd Book.